The game will be focused on groups of noble warriors supporting mighty, Legendary Heroes, each of whom can advance and become more powerful as the game progresses. These Heroes are the central focus of the single-player game. Four linked campaigns - featuring the Humans, Undead, Orcs and Night Elves - together form the story of the day the sky rained fire and war once again swept the battered lands of Azeroth. Players first take the role of Arthas, Paladin and crown prince of Lordaeron, as he investigates an uprising of Orcs and rumors of a plague sweeping the northern end of the kingdom. As the single-player game advances, the story moves on to other races, with each campaign picking up where the previous one left off. Heroes of other races appear throughout the campaigns, many times as allies, yet other times as enemies. “It’s very exciting to return to the Warcraft series,” stated Mike Morhaime, president and co-founder of Blizzard Entertainment. 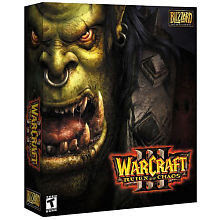 “We’re very proud of what we’ve accomplished with this game and we look forward to welcoming a new generation of gamers to Blizzard’s first PC game world.” Warcraft III immerses players in a compelling, dynamic 3D world of incredible depth and detail. Daunting monsters roam a landscape filled with neutral towns, strongholds, and temples, while stunning environmental effects bring the world to life. The game includes a robust campaign editor for creating custom 3D maps and unique missions, with scripts for units, spells, and action-packed events.